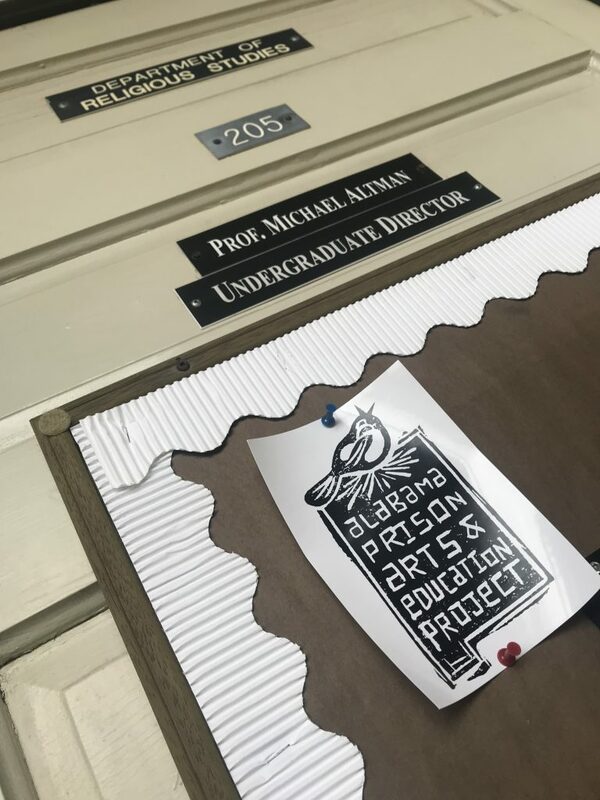 Religious Studies Professor Michael Altman will be teaching with the Alabama Prison Arts and Education Project (APAEP) once a week this spring semester. He will be leading a course titled Religion in America to incarcerated students at the Donaldson Correctional Facility in Bessemer, AL. Prof. Altman earned this opportunity after applying for and being named as the University of Alabama’s Arts and Sciences Prison Teaching Fellow. While the University of Alabama’s MFA Creative Writing Program has had a long-standing relationship with the APAEP, Prof. Altman is the first in the Department of Religious Studies to be awarded a fellowship and participate in the program. Founded by Director Kye Steves in 2003, the APAEP was initially funded by the National Endowment of Arts and The College of Liberal Arts at Auburn University. Today, it has expanded across the state of Alabama to include 243 different courses provided by volunteers and fellows from varying universities including The University of Alabama at Birmingham and Auburn University at Montgomery. The program allows inmates from 19 correctional facilities in the state to take a variety of classes, including humanities and STEM-based courses, for pre-college or college credit. They have access to a library of donated books, can have their work featured in art exhibits, and earn their bachelor’s degree. Recently, the NPR featured an article on the Alabama Prison Arts & Education Program in their comic series. Prison education programs across the nation have found correlations between higher education in prison and reduced recidivism. Decreased violence between inmates and higher employment rates after incarceration have also been attributed to programs similar to the APAEP. Although the Higher Education Act continues to be amended in regards to incarcerated students, the impact these programs have on an individual level is apparent. The Department is excited for Prof. Altman’s participation in the Alabama Prison Arts and Education Program and looks forward to the opportunity to give back to the local community. For more information on the Alabama Prison Arts & Education Program, visit their website Here. This entry was posted in Faculty Blog, News, Relevance of Humanities and tagged Alabama Prison Arts and Education Project, American Religious History, APAEP, Arts and Sciences Prison Teaching Fellow, Auburn University, Humanities, Liberal Arts, Michael Altman, Mike Altman, National Endowment of Arts, Relevance of the Humanities, Religion, Religious Studies, teaching, The University of Alabama by Morgan Frick. Bookmark the permalink.